As a leading provider of financing to the middle market, it’s important for CIT to understand the views of middle market executives on the key issues that affect their companies. This annual study offers us the opportunity to hear directly from this important sector of the U.S. economy. NEW YORK--(BUSINESS WIRE)--Middle market executives have a positive outlook for their businesses with nearly two-thirds (63%) indicating that their companies are better off today than last year, while 62% expect the size of their workforce to increase in the coming year. These are some of the key findings found in the third annual Voice of the Middle MarketTM study (www.cit.com/middlemarketoutlook) released today by CIT Group Inc. (NYSE:CIT) cit.com, a leading provider of commercial lending and leasing services. However, this optimism is tempered by concerns related to continued economic uncertainty, costs associated with complying with the Affordable Care Act, regulations and tax increases. Economic Uncertainty; Affordable Care Act Costs; Taxes and Regulations Top Concerns: While expressing much optimism for their own companies, there are still several issues that cause trepidation among middle market executives. 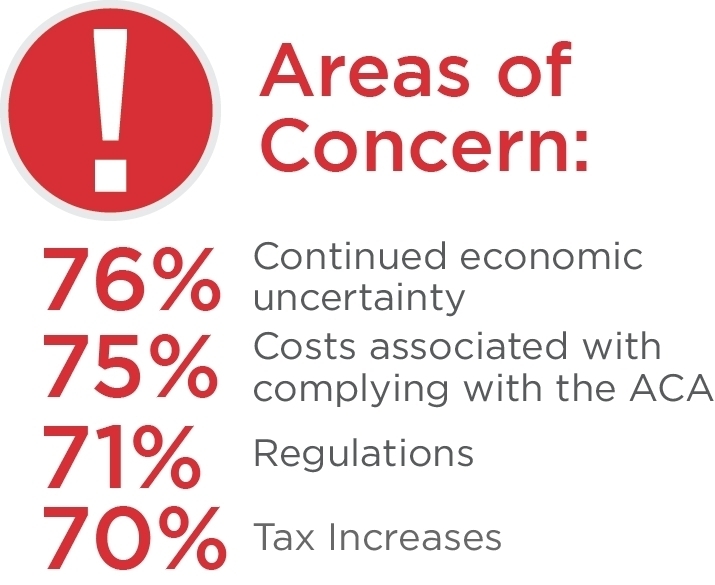 Those areas of top concern include: continued economic uncertainty (76%); costs associated with complying with the ACA (75%); regulations (71%) and tax increases (70%). Tax Reform Should Top Congress’ Agenda: Tax reform is a top priority for respondents with 84% saying they want Congress to take action on this issue. Additionally, about three-fourths want changes to healthcare reform, investments in infrastructure, and increasing domestic energy production. Less than half (40%) think raising the federal minimum wage should be taken up by the 114th Congress. Workforce Expansion Expected: Over half the middle market companies (55%) have experienced workforce growth over the past 12 months. Sixty-two percent say they expect the size of their workforce to increase in the coming year. More than half (58%) report that business demand and opportunities will lead to an increase in workforce. Growth on the Horizon: Fifty-eight percent of respondents expect to enter other regions within the U.S. over the next 12 months, while 62% expect to increase their range of products and services in the next 12 months. Optimism around Local Economies Trump National and Global Economic Outlooks: While expressing concern around continued economic uncertainty, executives are gaining confidence in the national and global economies. Twenty seven percent of executives, up from 15% in 2013, feel that the U.S. economy is performing strongly, while 14% describe the global economy as strong, compared to only 7% percent last year. Executives continue to express significant optimism when it comes to the strength of their local economy with more than half (51%) describing it as strong. Talent Management Top of Mind: Sixty-eight percent of executives are concerned about their ability to retain top talent and 65% are concerned about their ability to hire top talent. Middle market executives are also facing challenges around data security, with 67% saying this is a concern for the coming year. Middle Market Look To Republicans To Lead Congress: The majority of middle market executives (55%) say a Republican-controlled Congress would be good for their company, while only one in five think a Democrat-controlled Congress would be better for their firm (21%). Satisfied With Financing: Ninety percent of respondents said they are satisfied with their company’s access to financing, up almost 10 points from 2013. Ninety four percent report being satisfied with their current financial lender, and more than four out of five say they are satisfied with the variety of financing alternatives available to them and the cost of financing. Dissatisfaction with Congress and the President: Congress received low marks with 84% of executives disapproving of Congress’ job performance, while roughly two-thirds disapprove of President Obama’s job performance. In addition, the vast majority believe Congress is doing too little to support both small (86%) and middle market (77%) businesses. Majority Support GOP Presidential Candidate in 2016 Election: Just over half would like the next president to be a Republican (54%).The three most popular Republican candidates are New Jersey Governor Chris Christie, former Florida Governor Jeb Bush, and former Massachusetts Governor Mitt Romney. On the Democratic side, former Secretary of State Hillary Clinton generates the greatest support. CIT will host a webinar this afternoon, Wednesday, October 29th at 2:00 pm ET to discuss the study and the perspectives of U.S. middle market executives on the U.S. economy, the availability of financing and the health of their companies. Individuals interested in listening to the webinar can register here. ​View CIT’s corporate overview video (cit.com/corporatevideo) and View from the Middle™ (cit.com/viewfromthemiddle), which showcases our insights and ability to put our knowledge to work for the small business, middle market and transportation sectors. Follow us on Twitter, LinkedIn, YouTube and Facebook or register to receive press releases at cit.com/newsalerts. KRC Research, on behalf of CIT, fielded an online survey among 301 U.S. middle market executives representing a range of industries. Fieldwork was conducted in August of 2014. In order to be eligible to participate in the survey, respondents had to be in a leadership role at firms with revenues between $25 million and $1 billion, the majority of whose employees were based in the United States. Researchers defined leadership roles as: Owner, Board Member, C-Suite Executive (Chief Executive Officer, Chief Operating Officer, Chief Financial Officer, Chief Information Officer, Chief Investment Officer, or other C-Suite title), or SVP/VP/Director. of U.S. middle market executives indicated that their companies are better off today than last year. included: continued economic uncertainty (76%); costs associated with complying with the ACA (75%); regulations (71%) and tax increases (70%). 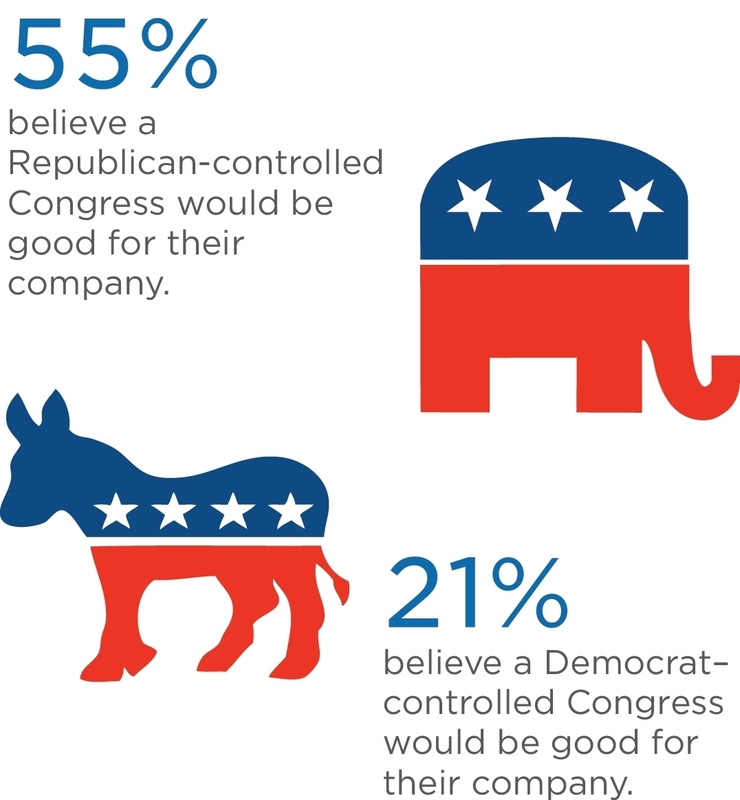 Republican-controlled Congress would be good for their company, while only one in five think a Democrat-controlled Congress would be better for their firm (21%).